There seems to be a new cross-genre in film, comics and games: famous figures in history beating the piss out of monsters. I recently previewed some photos and footage from both Abraham Lincoln: Vampire Hunter and FDR: American Badass! and loved what I saw. This is definitely a fresh twist to the horror genre, but it’s not the first time we’ve seen this battling of historical and horror icons. 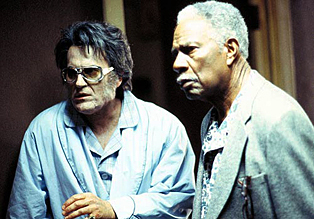 On the movie front, I immediately think about Bubba Ho-Tep, the story of Elvis surviving and living in an old age home with a reincarnated JFK (who happens to be African-American). When someone stirs up an ancient mummy, Elvis and JFK band together to defeat the evil. Directed by Don Coscarelli – best known for Phantasm – and starring Unwinnable favorite Bruce Campbell, the movie mashed the classic Mummy storyline with a well-executed What If comic. Campbell nails the aging Elvis shtick, and the late Ossie Davis plays a resurrected JFK, claiming that after his assassination he was patched up, dyed black and abandoned. Abraham Lincoln: Vampire Hunter, written by Seth Grahame-Smith (Pride and Prejudice and Zombies), is considered a mash-up novel. The concept is similar to combining Daft Punk with the Jackson 5 in the music world – take something with some historical significance and blend it with something new and bizarre, then ingest. In this case, we have a novel being turned into a film based on the secret diaries of Abraham Lincoln. The story is a biographical account of the life of Lincoln and how vampires were there every step of the way. It’s nice to see Edgar Allan Poe appear as a vampire expert to help further validate the story’s somewhat historical roots. There’s even a nice twist to John Wilkes Booth, but I won’t spoil it. FDR: American Badass! embraces a somewhat campy vibe that is more in line with Bubba-Ho-Tep than with the darker tone of Abraham Lincoln. When I first saw the clip, I thought it was some Grindhouse trailer made by an on-the-rise filmmaker as a promo reel. I seriously didn’t think it was a real movie until I did a little research. Apparently, FDR contracts his polio from a werewolf bite. He then goes on a rampage and swears to eliminate werewolves from the face of the Earth. 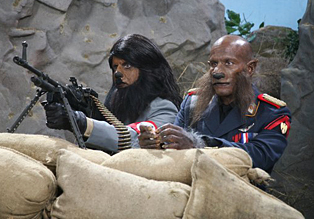 Lycans are traced back to Nazi Germany and Hitler himself, who seems to be the chief wolf. Starring Barry Bostwick, Ray Wise and Kevin Sorbo, this movie transforms Roosevelt into a polio-stricken, foul-mouthed, wheelchair-riding werewolf hunter and even includes historical greats like MacArthur, Einstein, Churchill and Mussolini. Moving on to comics, we find that we’ve probably seen this type of amalgamation in this medium more than anywhere else. Comics have always been the book equivalent of a movie experience. You have incredible stories with equally amazing artwork. Mike Mignola’s Hellboy introduced me to an alternate reality version of Hitler’s occult experiments. If Hitler had the power to summon the Devil himself, then losing England would have been the least of our worries. The addition of Rasputin pulls in another historical figure and successfully weaves him into a story that spans World War II and beyond. Here’s a franchise that also has successful films in its catalog as well. The original Hellboy movie does a fine job of melding alternate history and fantasy. The League of Extraordinary Gentlemen is another comic book/film franchise that assembles characters from past novels into an Avengers-like team to conquer a great foe. 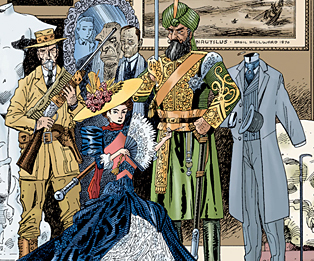 The Alan Moore comic features the pairing of Mina Harker, Captain Nemo, Allan Quatermain, Dr. Jekyll and the Invisible Man, banding together to foil Professor Moriarty. The film adds Tom Sawyer as a special agent and Dorian Gray, who switches teams and joins Moriarty on his quest for supreme dominance. The League is just another great example of the historical/ fictional mash-up. The choice of characters is outstanding, as they tend to be on the verge of being both the hero and the villain. Even though the film was panned, I like it for the simple fact that it might be the only pre-Avengers team-up movie. Call of Duty: Black Ops took the Nazi zombie concept from Call of Duty: World at War to the next level, with the inclusion of Fidel Castro, JFK, Robert McNamara and Richard Nixon battling hordes of undead that are invading the Pentagon. The idea of Castro joining forces with JFK, Nixon and McNamara is pretty absurd, but when it comes to zombies, the enemy of my enemy is my friend. Then there was the infamous expansion entitled Call of the Dead, which features a who’s who of low-rent film actors including Danny Trejo, Robert Englund, Sarah Michelle Gellar and Michael Rooker. The group goes up against master of all zombies, George Romero. 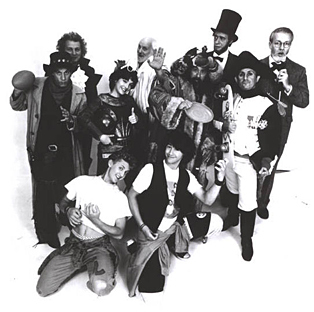 My earliest memory of this type of mash-up has to be Bill & Ted’s Excellent Adventure. While the film doesn’t exactly fall into the category of rewriting history, it does feature appearances by some very famous historical figures, and in essence, these figures help Bill and Ted to rewrite their history. Here are two down-on-their-luck high school rockers who are destined to become the center of a new, peaceful society. Their mentor from the future, George Carlin, pops into a telephone booth in 1989 San Dimas, California, and travels through time to help these two dudes pass their history final. Socrates and Billy the Kid make a great pairing, and it’s fun seeing Joan of Arc implement aerobics in her army’s workout. Napoleon likes ice cream, Freud hits on high school girls and Genghis Khan discovers sporting equipment. Beethoven rocks on the keyboards in the mall and Abe Lincoln himself makes a most excellent speech. I like history and classic literature, but I wouldn’t call myself an expert. That might stem from these subjects being forced upon me as lessons in my youth. But the idea of these mash-ups intrigues me and makes the subject matter something I can actually identify with. It gets me excited for future works of this sub-genre, in an age where oversaturation can make most things seem banal. Plus, it gives me a better appreciation for our founding fathers by being able to view them as superheroes. Of course, Lincoln should be remembered as the great emancipator of slaves and not for appearing on the five-dollar bill, but being known as a vampire hunter can’t hurt, either. Ken wants to know what your favorite historical/horror mash-up is. Tell him on Twitter @Kursse.